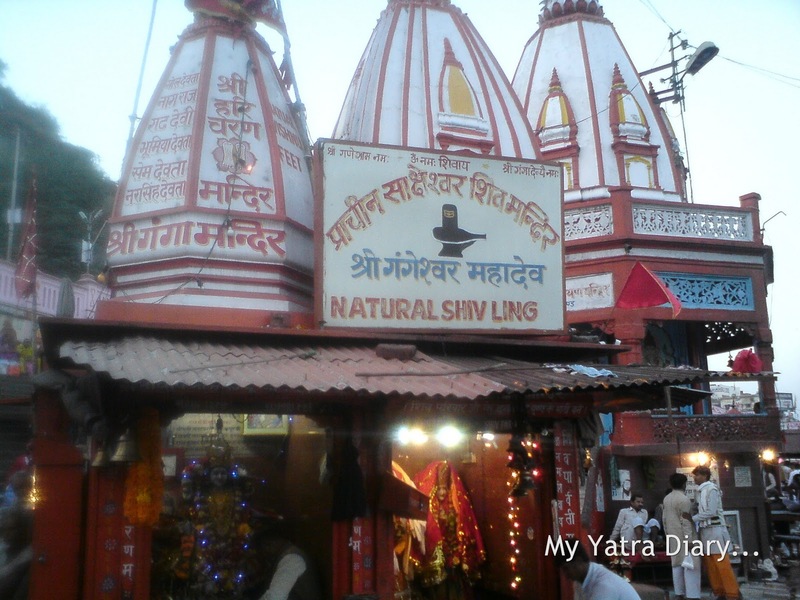 What better place there can be to conclude our Char Dham Yatra - virtually or otherwise – than at the feet of the Lord Himself…? 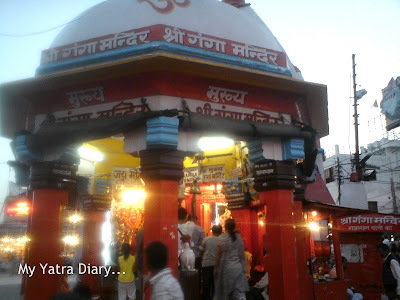 Yes, the final few minutes of the Char Dham Yatra of ours, saw us at the Har ki Pauri Ghat – the most venerated spot in the holy town of Haridwar. Literally, it means Lord Vishnu's (Har Ki) footsteps (Paudi), but it is today synonymous with the prolific event of Kumbh Mela, (that takes place four times every 12 years at 4 different sites, Haridwar being one of them) and for the highly enthralling evening Ganga Arti that holds the charm to captivate thousands of pilgrims from all over the world. 5:30 PM - At about half past five in the evening, crowds have already begun to gather. Steps are being occupied thick and fast by devotees pouring in from all corners of the town. 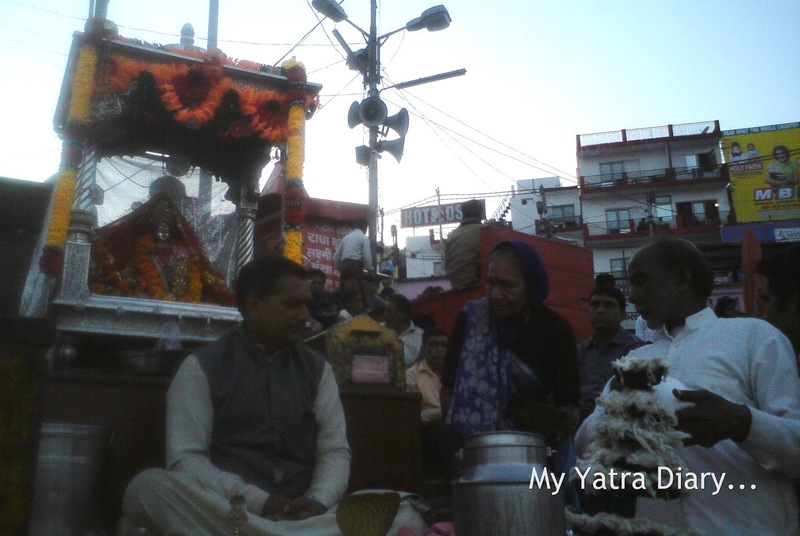 Priests sit on raised wooden planks calling out to pilgrims to perform various pujas for the well being of their family and near and dear ones. By and large, all the groups assembled at the steps maintain a very peaceful atmosphere. 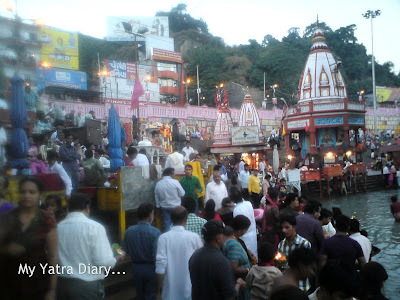 The ghats, in contrast, are abuzz with activity. Many can be seen splashing water onto their faces and heads, while others are busy floating leaf diyas (candles) in Her waters and some just find content by standing transfixed with hands folded and heads bowed down in prayer. I take a vantage point somewhere and spend a few quiet moments in retrospection. The bells, the temples, the waters, the devotion, the faith, all the elements in the atmosphere work in unison to nourish the mind, body and soul. Men in blue uniforms roam around asking for donations, the proceeds from which shall purportedly go towards the Ganga arti. Lights have come on and the river is twinkling with reflections, curious eyes are everywhere. The prayers should begin in any time now. 6.45 PM - The arti still hasn’t begun. But we have a train to catch and can’t wait any further... We need to track back and take leave. Ahh, thank you my friend for posting this. 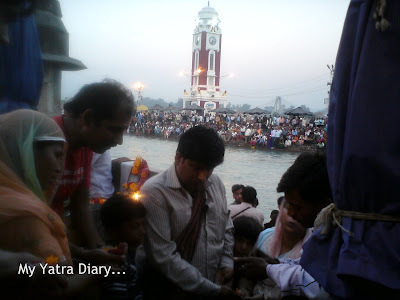 It brought such lovely memories especially the wonderful feeling when the leaf diya was placed on Mother Ganga. I had been to this place about 6 years back with my college friends as part of college trip . To see the ganga arthi was real exciting and wonderful experience . 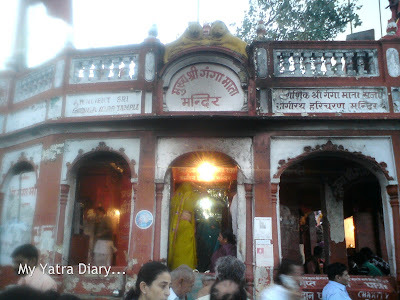 A beautiful and moving post, Arti, as always and such superb captures. They are the next best thing to being there myself! Thank you so much for sharing your experience with us! Have a lovely week! How beautiful the sights, sounds and smells must be! Lovely pics. Beautiful.....writeup & the clicks are awesome, Thanks for sharing. How beautiful! You remind me of my mother, who is spiritual like you. Beautiful to see and I can just imagine how wonderful it would be with the sounds -- of the bells and chanting. Thank you for sharing. What an amazing moment. Thank you for allowing us to share the magic with you. I can see so many people gathering along the river. Your words and photos convey the atmosphere well, Arti. A feast for the the heart and the senses. Lovely post .Brought back lots of fond memories. What a wonderful trip I've had, here's to my next armchair adventure. What an absolutely beautiful place. Wow. Just wow! Love your pictures in the night with the lights. So pretty. Beautiful pos Arti - these pictures capture the magic! One day i must go and visit India - and we'll have a blogger meet-up -that would be fun! Enjoy your day! Superb detailed coverage. Thank you so much. What a beautiful trip Arti....amazing capturs! You had a wonderful and interesting trip as always! I really feel the sound ,the atmosphere! Thank you for your heartwarming comment. I am gradually getting back my usual life. 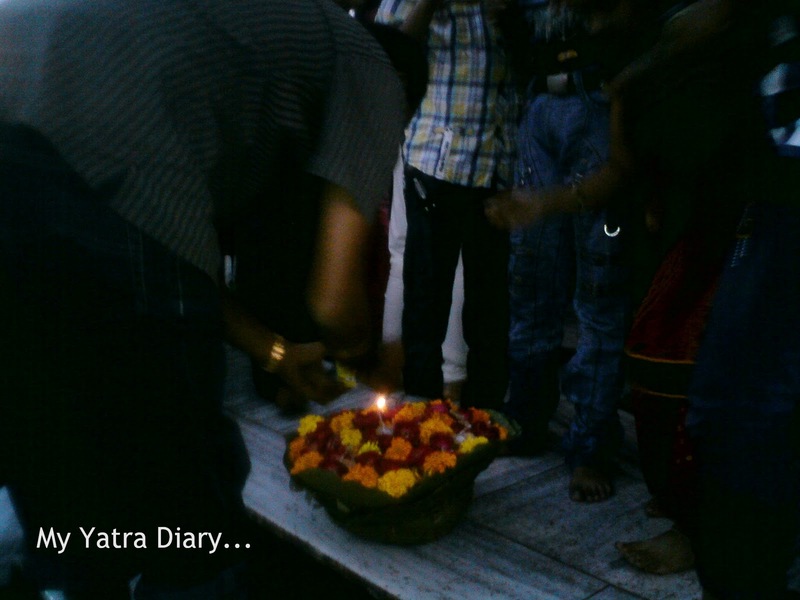 a nice narration of the aarti...i have experienced it many times...and each time, it feels divine!! Hi, Arti, I'm back. I'm interested in what the melody of the temple bell is or how chanting resonates. The atmosphere of the place is conveyed through five senses guided by your words and wonderful photos. I'm always amazed with the spiritual harmony when so many people get together in your country. Have nice days ahead, Arti. How beautifully you depicted Mother Ganga!! I have read a several times especially this part “Wiggling my way through the swarm, I reach Her shores and kneel down. I lower ・・・・・・“ Because I wanted to feel what sensation or feeling you had when you touched the waters. Arti, I felt. Thanks a lot for taking me to this holly pilgrimage. 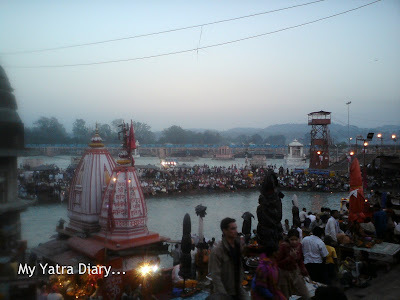 sorry Arti I always will try to comment early from here on.....wow each of these photos are so divine and lovely to view...when I was in India i used to visit Haridwar very often with my parents....I miss all this...Beautiful post! Interesting pics. 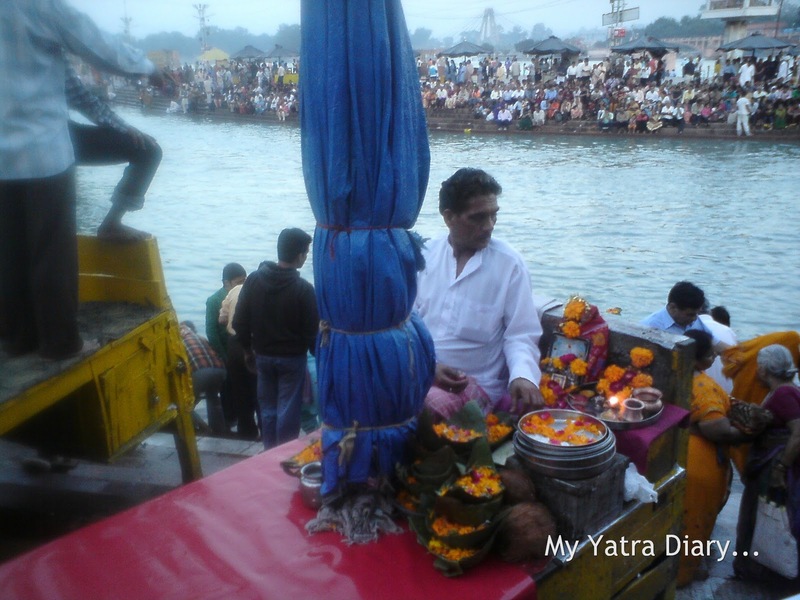 I especially like the diya floating on the river. Beautiful narration + pics. Gives feeling of really being there. every article in this series makes me want to visit your country more and more. i, too, don't want it to end. What beautiful pictures - you have captured the moment indeed! Thank you so much for sharing all of your thoughts with the pictures as well!! 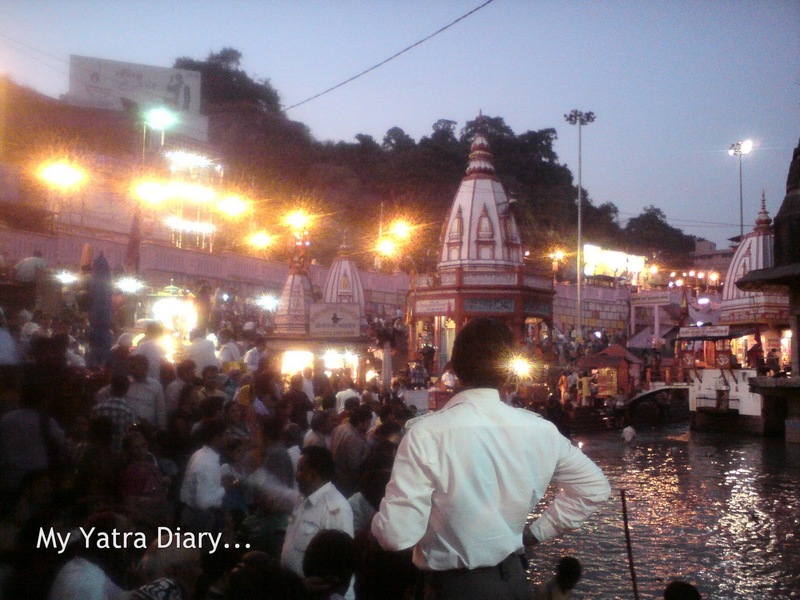 It's heartening to see the Ganges still look beautiful, serene and powerful at Haridwar. I'm sure she must be looking imposing when she originates from the Himalayas even now. 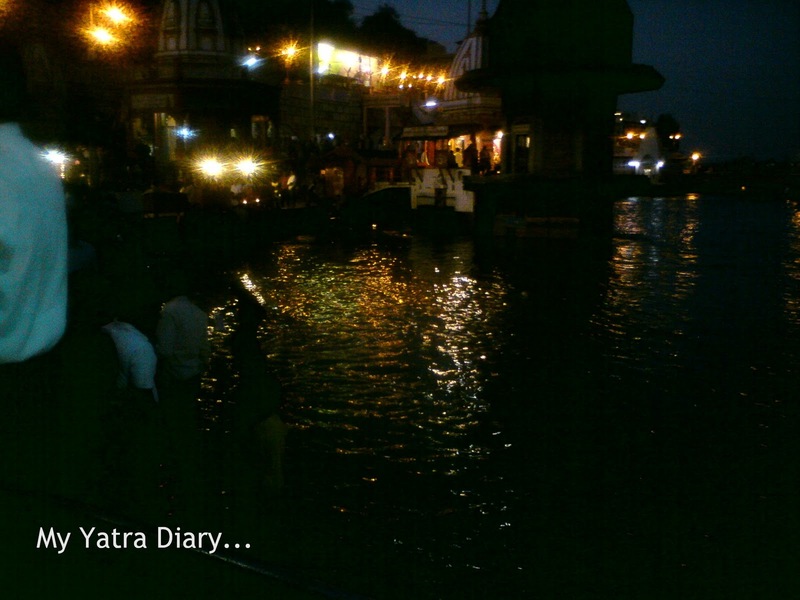 But it really pained me to see she is just a pale shadow of herself at Varanasi. Such a way you have with words and photos! Thank you very much for the wonderful photos of you, I lived the sacred moments! Many greetings and good weekend! years while I worked for BHEL in 1975-1977. Many many thanks for a nice presentation with beautiful pictures. I enjoyed reading your post and seeing all the lovely photographs. You really do live in an interesting and colourful place. All your articles are so inspiring and so interesting with the mixture of cultural lessons and photos. I'm intrigued and fascinated by India and its incredible festivals. Hope you have a fantastic week as well! Awesome post,wish you and your family a very happy deepawali. 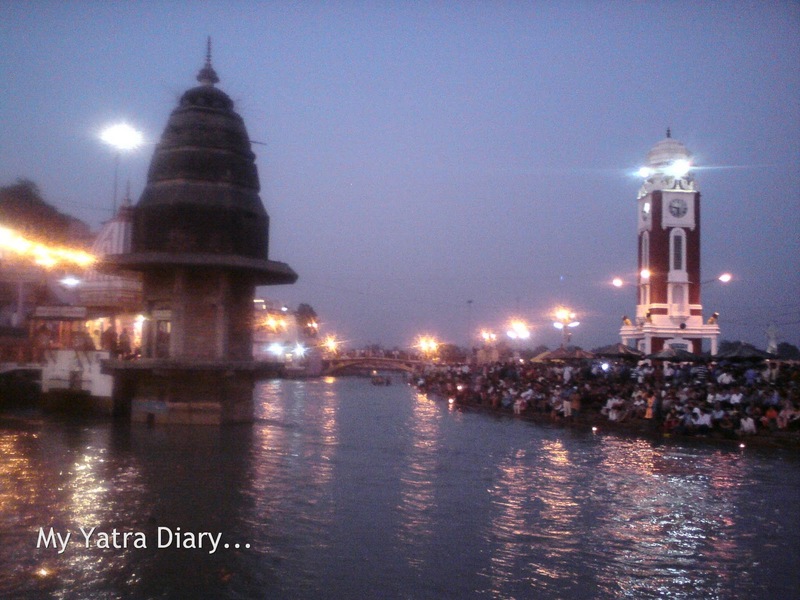 Images of Ganga aarti are impressive. The yatra of ganga pushkar is also bring more peace to your life. Pushkar lake is well known holy lake in India. 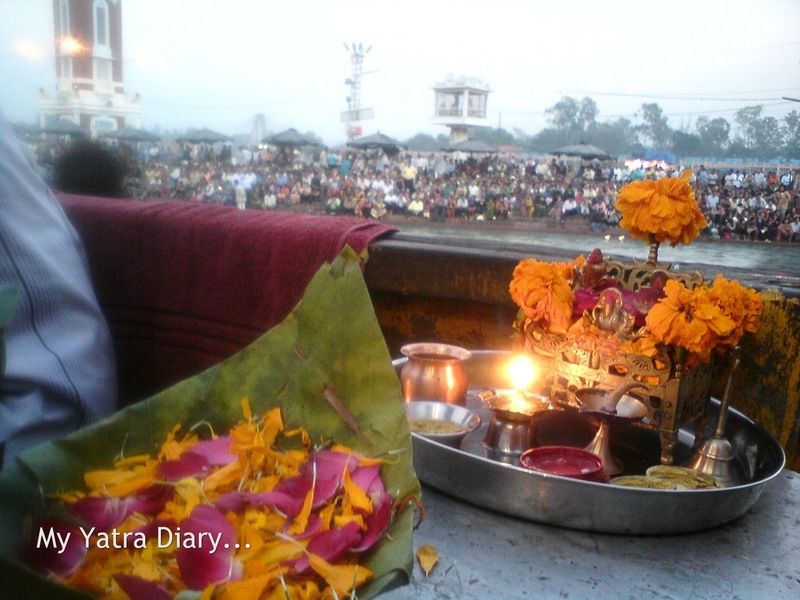 It is always amazing to see the Arti. 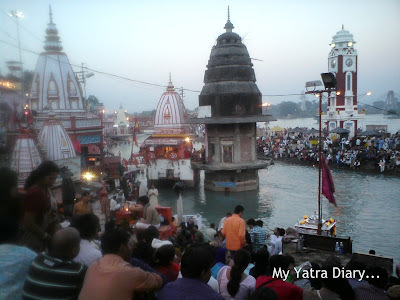 Varanasi is an the place that make you experience the religion, culture of India. 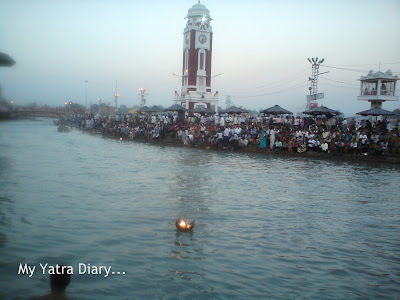 It is a magical moment to see the whole Ganga Aati with such large religious congregation. 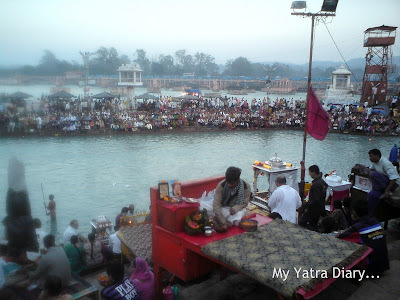 The sound of ringing bells, cymbals, chanting mantras and gurgling Ganga River is utopian. I wish to visit Haridwar again. 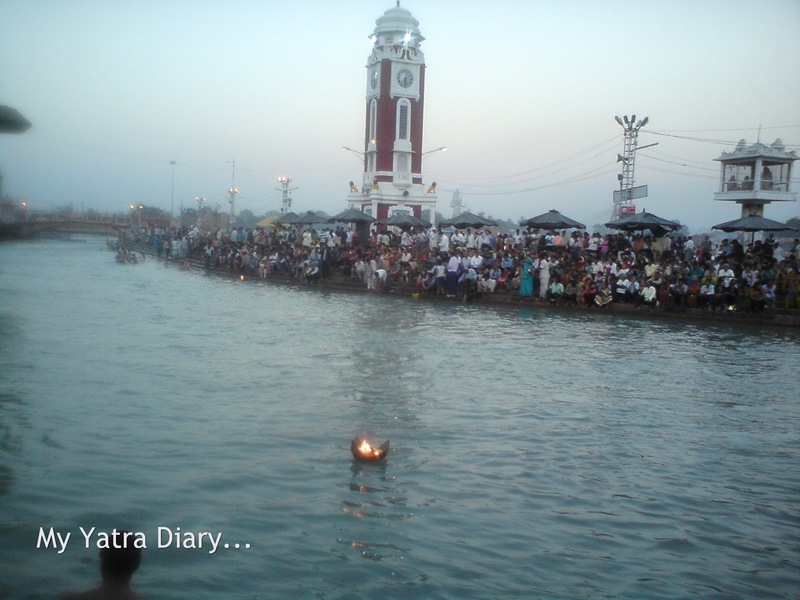 A must see Ganga aarti for all.